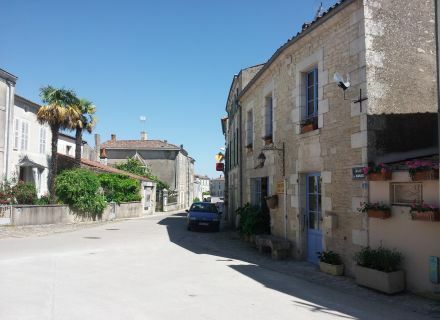 Welcome in this charming village at the heart of the “Marais poitevin”. I invite you to discover this village typically “maraîchin” which was about situated 2000 years ago in the mouth of Sèvre Niortaise. 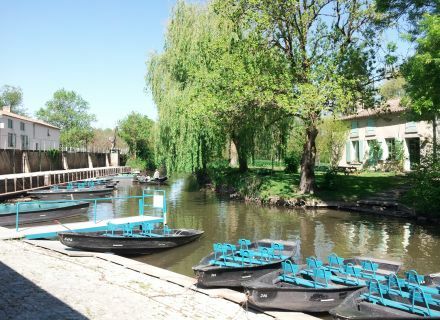 This place steeped in history comes to light to the visitors who take time to measure its alleys and canals in a picturesque and quiet setting. To start with, enter the village and begin your visit with the place of the church in the center of the village. 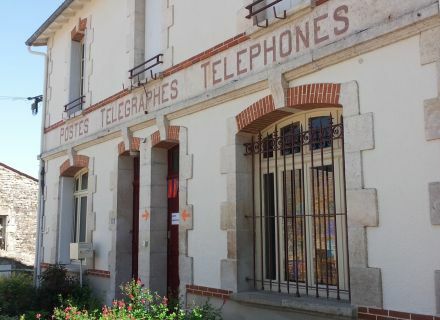 On this place is the former post office and several workshops of regional, souvenir products and arts and crafts. In front of the Tourist office which shelters an exhibition of old tools and fishing tackles, you will find a first bulletin board explaining you the various stages of the development of Arçais. In the time when the boat gave rhythm to the life of “maraîchins”. From here, two routes of 3 and 7 km hike will allow you to discover the peculiarities of this village. Come down on the port, you will perceive two wooden cranes arranged in every extremity there. They served to take out the wood which was extracted from the Swamp by towing it wood. Then it was raised on charettes to forward it to the various sawmills of the village and the surroundings by following the path of Charret. You will be also surprised by this surprising building which overhangs the port. "The Lodging house" as we call it, is in fact a house Napoléonnienne built in 1829 by a former officer of Napoleon. He preferred to build his house on the port for his access to the swamp what allowed him the storage of the wine, the wood, the traditional white beans and other goods. This period was prosperous and the intense business. But especially, he wished to share to the inhabitants of the center of the village of his changing rooms that he rented in reasonable price to put down tools and goods there. Indeed, these did not have the opportunity to have a direct access to the water thus it did well a service to them. However, he reserved two changing rooms for the relay of Post office which allowed the maintenance of the equipment and the rest of horses. This access to the water was essential to the inhabitants because every owner of house also possessed a plot of land in Swamps. To cultivate it) or put down its animals in the feed there, the use of the boat was essential. About 40 kilometers of channels go all over the municipality of Arçais, so allowing to circulate through 1000 hectares of Wet Swamp (flood-risk area). 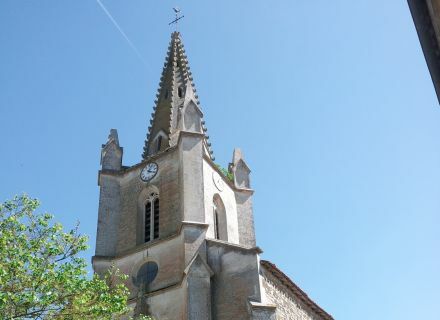 That is why, you will notice several small ports (Cheusse and “La Planche”) during your wanderings in the heart of the village. These small ports went little into the village and were harmed by narrow alleys which allowed the access. These passages were of the width of a wheelbarrow and necessarily had to remain clear to facilitate the traffic. Today, certain owners having acquired houses on each side certain alleys closed the access. What would have been source of conflict and trial previously ! If you continue on the right by borrowing the towpath, you will discover really interesting architecture. These houses built on the slope affected by the former cliff are remarkable by their roofs in a single slope. 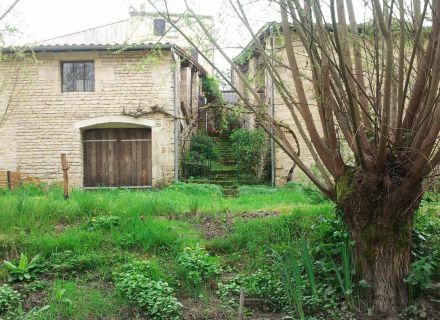 On the high part was the livable space of the house, in the center an opened part allowing the storage of farm implements and on the low part, the cowshed which always sheltered one or two cows, essential in the life of the “maraîchin” for their good milk. And of course, "the box with fertilizer" under the windows of the cowshed or "bouaites", which served to make cross the fertilizer outside during the cleaning of this one. 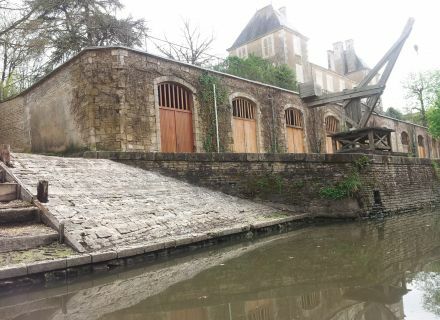 Now, imagine the traders pulling their boats or lighters full of diverse and varied goods, following this path which allowed them to join “Sèvre Niortaise” situated in 1,5km of the port. In fact, as a bypass, the “Biefs de La Taillée et Minet” allowed the junction with “Sèvre”, what facilitated the inland water traffic in both directions. They could join so easily Niort which sheltered for a very long time the biggest market hall of the kingdom of France ; or La Rochelle, one of the biggest ports of the west coast. It is moreover by these waterways that arrived traditional white beans, potatoes, tomatoes or poplars. Just like the coypus which we breeded for the meat and the skin as well as the ermine or the mink. Arçais has the peculiarity to offer a very complete panel so much at the level of its architecture : landscaped and built heritage, that by its fauna and its flora protected. The lovers of history and nature will find a cultural wealth there which makes from now on of this village and its environment a key destination. 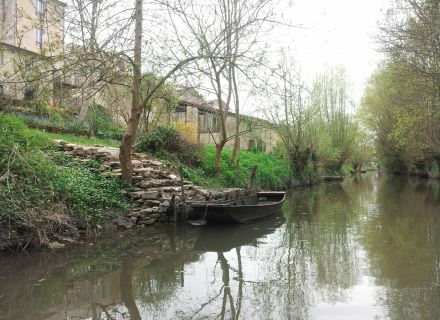 It is indeed a part of the “Marais poitevin”, one of the 41 big conservation areas of France ! Hike, in bike, in boat or in canoe, come to travel its paths which will pull you in an unforgettable atmosphere where small and big will get fresh ideas. In spring, the soft subdued light by buds in flower of ash trees tadpoles, weeping willows and hawthorns will amaze you. In summer, the sweetness which reigns over conches, reaches and channels will enchant you. In autumn, the brilliant colors of the foliages will transport you in a quiet and serene atmosphere. And the winter, the mist halfway up in the flooded plots of land will give you the illusion to be in a hitchcockian landscape. In any event, a single watchword, TAKE ADVANTAGE of this green and natural space by respecting it as is proper. And especially, VOTE for Arçais on the occasion of its appointment in the show "The favorite village of the French people", before May 22nd. It will allow to have a small spotlight which will value it and will make it known about the largest number. I hope to have the opportunity to see you soon in our beautiful village.